A tested pairing of moving averages of price time-series data can augment profit and reduce risk with index investing. 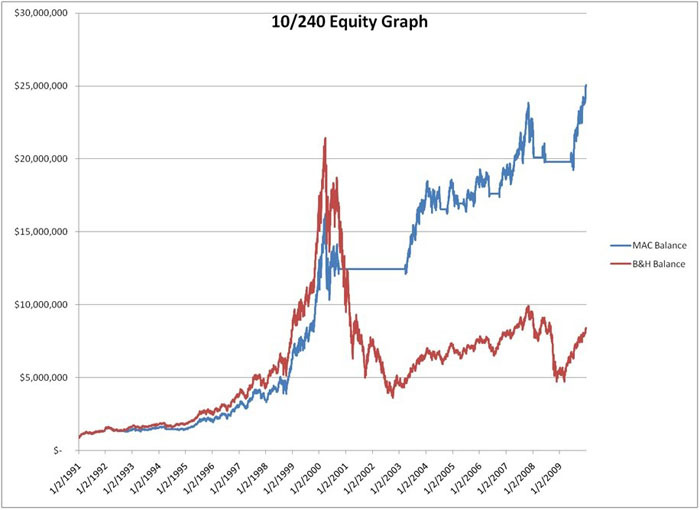 To test this hypothesis, we ran studies using a hypothetical million dollar portfolio investing in the most heavily-traded security in the world, the QQQQ (Q) shares, from their IPO in 1990 through 2009, a period of nineteen years encompassing both a significant bull and bear market, as well as trendless periods. We tested various combinations of moving averages and note when the averages cross. Each time the short-term average crosses above the long-term average, we buy the Q shares with all available cash. When the short-term average crosses below the long-term average, we sell the Q shares and hold cash. As a control, we buy the Q shares with the million and hold throughout the test period. After nineteen years, this control BAH portfolio grows to $9.25 million. In our tests, we opt to remove as many other variables as possible to isolate the effect of the crossover system itself. We give no credit for interest earned on cash. We do not use any form of position sizing, or downside risk control, other than the system's natural risk control of selling when the short-term average crosses below the long-term average. In this era when retail deep discount commissions are lower than institutional rates once were, commissions are insignificant, where the most active averages generate only 25 trades in fifteen years. Testing this highest volume security in the world, where it is easy to sell several hundred thousand shares without moving the market, make skid insignificant. Since over half of worldwide money under professional management is in tax-sheltered accounts, we do not consider tax effects. Here is one high-yielding study from the series of tests: the 10 / 240 moving average crossover. We buy when the red 10-day moving average crosses above the blue 240-day moving average, and sell when the shorter average crosses below the longer. Note this methodology goes long at the beginning of uptrends, whipsaws several times in choppy periods, and keeps the portfolio safe from disastrous downtrends. After managing risk with the moving average crossover signals shown above, below is the equity balance. The BAH portfolio in red, the MAC portfolio in blue. On the summary table of test results below we see that a 10 day/120 day combination results in a net ending equity of $8.9 million, not very encouraging compared with the buy and hold control portfolio. As we run tests with longer averages, the outlook brightens. In fact, testing some of the longer combinations, the outlook becomes very bright indeed. Note the plateau on the matrix where the equity averages $17 million, two times the BAH portfolio. Here are the results testing various parameters. Compare with the BAH strategy's return of $9.25 million. The scope of this paper is to present broad brush results to illustrate a principle. Those who want their portfolio managed according to this method might investigate the details of drawdowns, the emotional quotient needed to stick with this discipline over the long term, position sizing algorithms, and the effect of various start-dates. The start date greatly affects results for the BAH investor. Many more bought near the top than at the beginning, and so missed much of the bull market, then lost capital in the bear market. The yield of a BAH investment is highly start-date sensitive. The crossover system mitigates such sensitivity. It is prudent to have this rudimentary form of risk control in place to guard against catastrophic loss, as the BAH investor who watches equity climb to Everest-like heights only to lose 83% of it in the 2001 bear market might now agree. This method requires vigilance and sufficiently high emotional quotient to act upon signals despite market noise. The author recommends investors seek a wealth manager who is aware of this prudent method of risk control. If the reader anticipates trading on one's own, use good charting software to step through each of these trades, imagine one's emotions at each important juncture along the way, and thus set one's expectations in a realistic way. During whipsaw trendless periods, one requires the fortitude to sell, then buy again soon afterwards, to first protect against loss, and next to participate in growth. In extended bear markets, this crossover method reveals another kind of compounding. After a bear market, a portfolio can buy more shares of the stock with the cash from the previous sale than if one only buys and holds. In this test, the BAH portfolio buys and holds 200,000 shares. As a result of this share compounding, the moving average method ends the test holding many more shares. The application of digital finite response filters, commonly known as moving averages, to equities price data series helps an investor see trends greater than the daily fluctuations. Most tested iterations of this moving average crossover method handily outperform a passive BAH strategy during the nineteen-year test period, a period which includes a great bull market, a devastating bear market, and trendless periods. Most combinations produce profitable results. A robust set of parameters produce significantly better returns than the BAH strategy. All tests produce a more gentle volatile equity curve with smaller drawdowns than buying and holding for the period. Click here to view original publication. Trading Tribe research group, Incline Village, NV. Oct. 2004 - Mar. 2005. 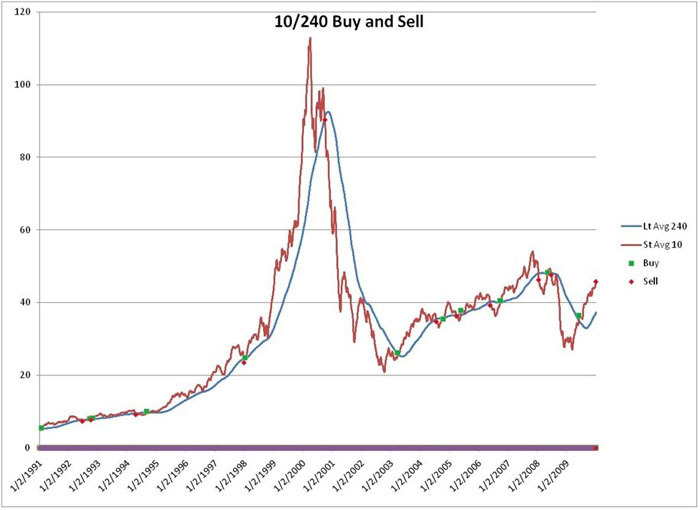 1990-2004 QQQQ chart. Chart. TeleChart2000. http://www.tc2000.com. 2005.